After Aprils' bumper three part empties posts normal service resumes with a smaller selection of products to talk about this month. I reviewed the Exfoliating Foot Mousse from Margaret Dabbs here but in short I’m not entirely certain my feet require a separate scrub beyond whatever body scrub I'm using at the time. This mousse/scrub was a lot of money and purchased in a moment of madness - I won’t be repurchasing as there wasn't anything special about it for the price and more importantly I hated the scent. For some reason I really didn’t enjoy using the L’Oreal Heat Styling Spray for no reason other than I hated the packaging, or more specifically the trigger pump. I found the press button lock a pain to activate and unnecessary for my needs and whether we blame my being left handed or not it just felt cack-handed to use. The product itself worked fine, it didn’t make hair greasy or add extra weight and no frizz to speak of. 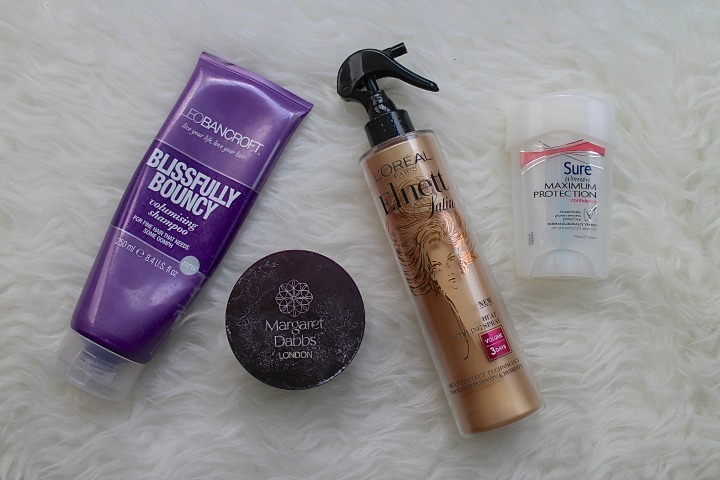 I would repurchase but not if there was an alternative available and since thinking fondly of Vo5 Plump It Up Amplifying Volume Blow Dry Lotion I have used in the past (you can read about that in this post) that's what I have since repurchased. I picked up this shampoo on one of my supermarket grocery shops (anyone else feel like buying beauty products in Tesco does't count towards the usual spend?) as I hadn't seen or heard anything about it and why not give it a try. Overall it was just pretty nondescript. Some days I liked the results, others not so much and that was more often the case. 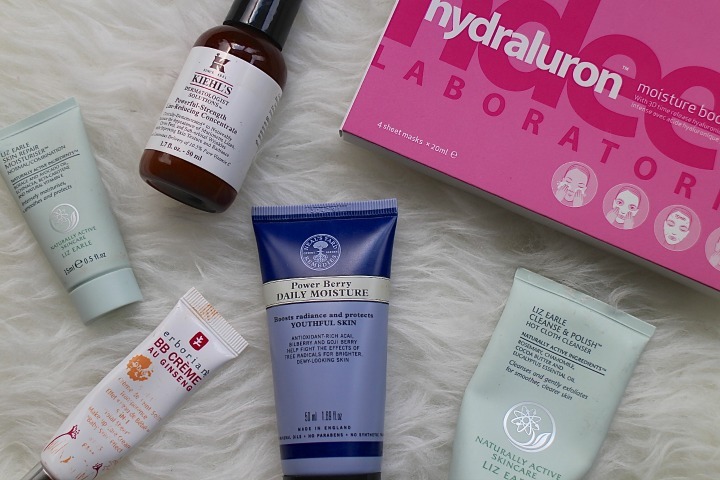 Hydraluron in it's serum form isn't the holy grail product for me as it is for many others but that didn't stop me giving the Moisture Boosting Mask's a try when they were released a month or two ago. Where the serum failed for me this succeeds. I much prefer popping one of these masks on when I feel like my skin needs a hydration boost, whether that's the night before a big occasion or the morning after. They came in handy last month as I popped a few of these in my case for use between flights - I wasn't brave enough to wear on the plane though, especially after my friend told me I looked like the scary person off of the tv show Luther! 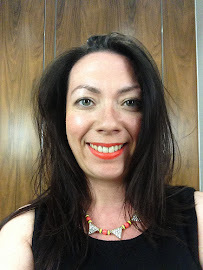 I took a tube of cleanse and polish on holiday with me as I know I can rely on this cleanser day and night whether it's to help wake me up in the morning or remove make up at night. At home I usually use Cleanse & Polish as my morning cleanser but for travel when I don't want the fuss or extra bottles of balms and the like this comes in handy and I know I'll be able to maintain my skincare regimes - there's a reason this cleanser is a multiple award winner. Sadly I don't share the same love for the moisturiser as I do cleanse and polish. With a handy travel sized tube I took this on holiday wondering if my opinion would change and unfortunately it didn't. Whilst the product itself works fine for on my skin I can't bear the scent, it's just a little off for me. This moisturiser has to go down in history as the longest lasting, it felt like I was using this forever. It was actually a magazine freebie that I tried and wasn't a fan of as it was too heavy for my skincare around the warmer months when I initially used. Then Winter hit and I found that a few dry spots were appearing and impacting on my Make Up Forever HD Foundation application. I pulled the Neal's Yard Moisturiser out of the drawer and it cleared up the dry patches nicely and all was forgiven. Kiehls Line Reducing Concentrate is billed as the morning version of the Midnight Recover Concentrate I talked about here. When I was sold this product the sales assistant told me a story about how someone used this other than botox. Whilst I haven't tried botox I think it's fair of me to say that this product didn't work miracles but as I mentioned in my MyChelle Skin Analysis here (and it's worth mentioning again!) I only have 25% wrinkles at 35 so maybe it did do something. I can't quite say why I love the Erborian BB Creme Au Ginseng but I really do and was prepared to repurchase until I received a new tube for my birthday. This was my go to base product last Summer after receiving in the Selfridges Beauty Box and I will be turning to it again this Summer. Lightweight and working with your own skin tones to create a natural shade this is a must have for me. I've talked about Sure Maximum Protection Deodorant in a number of posts before (you can read them here) and it has been repurchased on a number of occasions so I think that is enough said. I made the mistake of trying another brand recently (stay tuned for May empties) and it just did not match the Sure standards. Anything spark your interest from the list, let me know in the comments. Beauty products in the supermarket definitely don't count!! The Erborian BB Creme sounds lovely!